Well-made horror is only too rare these days, but well-made horror made with only one screen shot is virtually an impossibility -- that is, until Open Water came around. 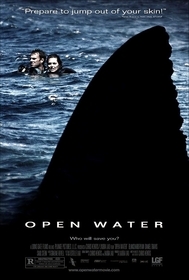 Open Water has been defined as “Blair Witch Meets Jaws.“ This seemingly accurate description is actually quite a discredit. Open Water has the best qualities of both films, but blew both of them away in the suspense department through just a touch of courage. Open Water is roughly the story of young couple who get accidentally left behind by their scuba-diving boat, and now must face survival in the open, shark-infested ocean. I personally wanted to see how the filmmakers were planning on keeping my attention for 80 minutes of two people bobbing in the water (which, to be fair, is quite a bit harder to achieve than three teenagers lost in the woods with an exacerbated witch following them). The filmmaker made this daunting task seem effortless by presenting us with two highly developed characters. He took the first 20 minutes of the movie slow (perhaps too slow), focusing on the couple’s relationship and their problems. This, though a little painful to sit through upon first viewing, became forgivable as it was incredibly important in making the bobbing-in-the-water scenes work. Nothing was used gratuitously whether it be love, humor, fear or frustration. By painstakingly developing a couple whom we all know, speaking realistic dialogue, and acting much the way we all would in the same situation, the filmmaker paved the way for the viewers to put themselves in that water with them. You really, REALLY wanted this couple to make it through because you could physically feel their fear. And that, my friends, is how suspense at its absolute prime is made. Yet even the most relatable characters can still find themselves in a failed film if the antagonist is not equally relatable. Of course, I am talking about the sharks. Being a person who knows her share about sharks as her family are avid Shark Week viewers, I was quite pleased that the filmmaker was true to how sharks would REALLY react to two presumably tasty scuba-divers in the middle of the ocean. The fact that the sharks were portrayed as simply hungry animals following their basic primordial instincts made the movie more unpredictable, and hence much more suspenseful. This alone blew away Jaws in the realism department. Don’t get me wrong, Jaws is the first and is still the best, but you are quite aware that the whole story could never happen as 1) sharks are simply not that aggressive and 2) mechanical sharks are generally not indigenous to large bodies of water. This brings me to my next point. Open Water used real sharks. I’m not talking about pampered, Hollywood sharks. They used hundreds of real, wild sharks living in the ocean. As you might imagine, this tends to help with the suspension of disbelief. From a cinematography angle, the filmmaker made a fine choice shooting the film on digital video, as it looked like a home camcorder. The method that made Blair Witch effective, did the same for Open Water tenfold. Not to mention, the lighting was of the caliber one would expect from a big-budget, studio film. Filming underwater scenes are always difficult, but even more so in the dark. Open Water had no problem. Even if you don’t like the film, I guarantee the climax scene alone is worth the price of admission. It is hands down the best use of lighting and fast-cuts that I have ever seen in my life. This isn’t to say that the film is perfect. There are some moments of “get on with it, already”, and the beginning part probably could have been cut in half without much of a decrease in the film’s integrity. However, the monumental barriers this film overcame --and overcame with flying colors -- erases all of its mistakes in a bat of an eye. To say it was a knock-off of Blair Witch is infuriating. Blair Witch, though a creative film in its own right, did not break any walls, nor did it seem capable of delivering its horror without a tongue in its cheek. Open Water was cut and dry, pure, primal terror. I urge you to give it a chance, especially if you perhaps need an excuse to get out of a deep sea fishing expedition.